IF you live in Edinburgh, you may already know Kirsty Whiten’s work. Three of her animal-headed figures feature on the gates of the Bongo Club on the Cowgate. More appear on a wall mural in Dalmeny Street and on giant paste-up posters on nearby Leith Walk. “Working in the street is the absolute opposite of me working away quietly in my studio on my own for weeks on end, which is usually how things are,” says Whiten. Seven years ago the artist returned to the Fife village of Craigrothie, where she grew up, after over a decade living in the capital. Exotic and bold, Whiten’s figures often captivate and provoke. Having exhibited consistently in Scotland and internationally since she was awarded a first in fine art from the Edinburgh College of Art in 1999, Whiten now presents ICON ORACLE, an exhibition of five large oil paintings, eight watercolours and a selection of smaller studies. The former – the “icons” – feature figures involved in a ritual of some kind. In a series titled Anointing, one woman tenderly applies coloured pigment to another’s body. In Initiation (marked), a man cradles another in his arms. The pose is reminiscent of La Pieta, Michelangelo’s sculpture of Mary with the body of her son after the Crucifixion. “I always loved La Pieta – I studied it at art college,” says Whiten, who also cites as an influence The Ecstasy of Saint Theresa, Gian Lorenzo Bernini’s sensual sculpture of the Christian mystic. Whiten continues: “Maybe it was to do with what I was going through personally at the time when I was painting these, but the power of one person holding, cradling another, is very strong to me. Themes of healing and magic are present in the Oracles, delicate, jewel-coloured watercolours depicting formidable figures such as The Beast, The Elders, The Crone and The Great Mother. The Oracles, she explains, could function similarly to Tarot cards. She adds: “I imagined that each of these Oracles, you could lay them out with someone, and talk about the images they see within them. That they were tools for navigating this subconscious, symbolic stuff. Accompanying the exhibition is a book of the imagery featured in ICON ORACLE. It follows 2016’s WRONGERRITES, Whiten’s book of mis-remembered rituals, and both have been crowdfunded by the artist’s supporters. Rather than a vehicle for selling paintings, Whiten says they are “art as books” – works of art in themselves. Soon after this exhibition at Arusha Gallery, Whiten will travel to New York for a month-long residency at The Mothership NYC, in Greenpoint, Brooklyn. “They have studios where there are three permanent New York artists and then they have spaces where international artists can come for residencies,” she explains. “They’ve got a community there where they do salons every week and a space where they have performances. It seems like the sort of place where it will be really easy to slot in and meet people. A working artist for the best part of two decades, she has largely taken a DIY approach to exhibiting and says crowfunding suits her work. 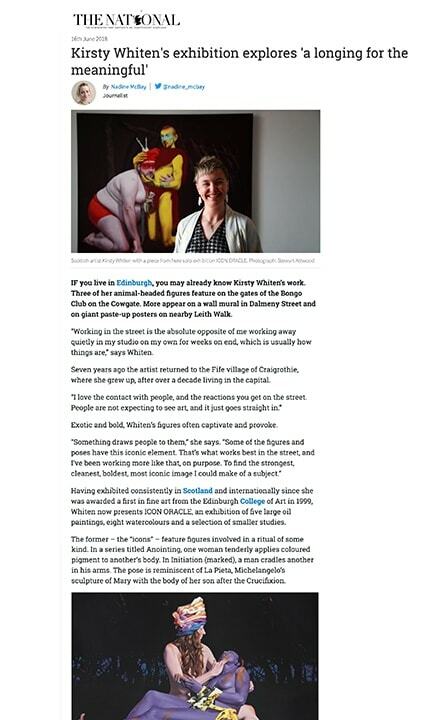 ICON ORACLE is the first time Whiten has put out a publication while also putting on an exhibition, and she says it feels “quite a luxury” to have had the backing and support of the Arusha Gallery.